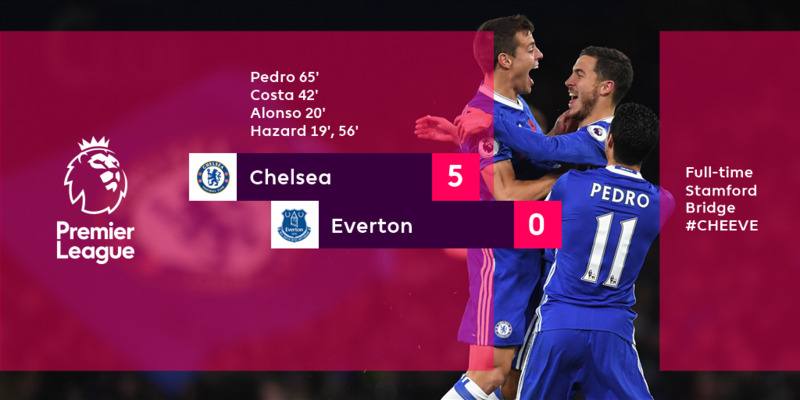 Chelsea soared to the top of the Premier League table with an Eden Hazard-inspired 5-0 win over Everton at Stamford Bridge. 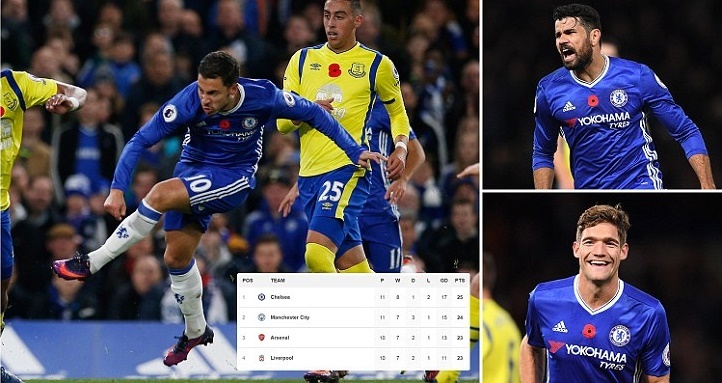 Eden Hazard scored double while Marcos Alonso, Diego Costa and Pedro also score to put Blues top of the Premier League. But will they stay there considering the north London derby tomorrow as well as Liverpool being in action at home to Watford? Hazard opened the scoring in the 19th minute after cutting in superbly from the left-hand side, and scoring the kind of trademark goal that saw him win PFA Player of the Year in 2015. The second Chelsea goal came just 23 seconds after the re-start, with the Blues punishing Everton for some slack defending, allowing wing-back Marcos Alonso to fire in beneath Maarten Stekelenburg. Diego Costa scored his eighth goal of the season three minutes before half time, leaving the visitors wondering quite what had hit them. Chelsea carried on as they’d started in the second half, with Hazard weaving his way through the Everton defence to score a delightful fourth in the 56th minute, and eclipsing his total goal tally for last season in the process. Less than ten minutes later, it was 5-0 as Pedro tapped in to cap a fine individual display for him, and condemn the Merseysiders to an embarrassing defeat, conceding as many in one game today as they had in their previous five league games. For now let me leave you with the league table as it stands after todays matches.